A Gravity Generator is a device used to create artificial gravity. It may only be place on large ship or station building blocks. The orientation of the gravity generator dictates the direction of gravity, with the side of the block that the gravity generator is installed on becoming "down", and the side with the control panel and the opposite one becoming the "depth" axis, relative to the gravity generator. Multiple generators will act together, increasing force significantly, and multiple generators at different angles will all play a role on the direction gravity affects the player, objects, and Artificial Mass Blocks. The gravitational acceleration can be configured using a slider, with possible values being between -1G and 1G. By adjusting the depth, height, and width sliders accordingly, the shape of the gravitational field can be altered to be any variation of a rectangular prism, whether cubic, flat, tall, wide, narrow, short, or long. 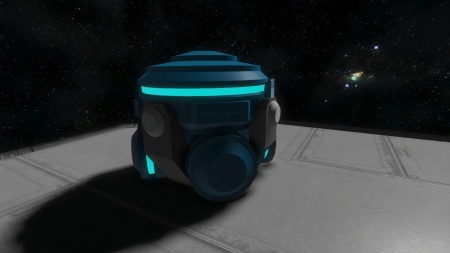 Note that in Survival Mode, the larger the effective volume of the gravitational field and the acceleration force, the more power consumption the gravity generator will use. Considerable energy can be saved over time by carefully placing the gravity generator in a more central location and then adjusting the field to affect a smaller area. Grav Generator with the dimensions of the gravity field shown. Artificial Gravity can also be configured to affect the shape of the gravitational field. The maximum effective depth, height, and width is 150 metres centered on the gravity generator, or 75 metres in all directions. Depth - The distance "behind" and "in front of" the keypad of the gravity generator. Height - The distance "above" and "below" the gravity generator. 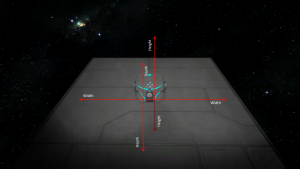 Width - The distance "left" and "right" of the gravity generator. Planets and Moons by default have their natural gravitational fields. While it is possible to use gravity generators in the presence of Natural Gravity, its effectiveness diminishes the higher the natural gravitational force is. It reaches to a point where Artificial Gravity has no measurable/noticeable effect. This page was last modified on 19 March 2018, at 16:30.